Berry reports to Hammond on a list of endowed days and travel plans. 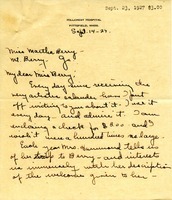 Berry sends a clipping about Lucille La Verne, who is advertising that she is raising a million dollars for the school. Berry is concerned that La Verne's effort will reflect unfavorably on the schools. Browne discusses how she wishes to approach painting Martha Berry's portrait, working partially from a miniature of Berry painted ten years ago, but primarily from life. She tells Berry she would be able to erase "the traces of the past ten years" in the new portrait if Berry wishes, but thinks that an accurate representation of her face would be more interesting and compelling to potential donors. 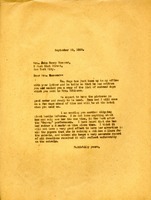 A letter thanking Mrs. Lapham for her gift towards the Endowed Day for the deceased Mrs. Richards. 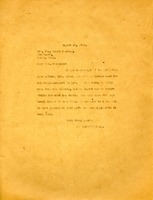 Letter to Mrs. Robert Sturgis from Martha Berry informing her that Miss Berry will be happy to be with her on the 28th and 29th and also states that if there is anything that she needs her to do that she is at her service. Miss Berry also states that she is glad that Mrs. Hammond is going to be there as well. She thanks Mrs. Sturgis for being interested in the schools. Miss Berry informs Mrs. Sturgis that the schools have many visitors but that most of them only come to get ideas but that the schools need visitors who will invest in the lives of the boys and girls attending the schools. She informs Mrs. Sturgis that she is a God send to the schools and thanks her again. 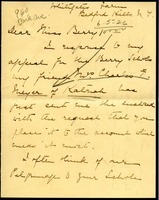 Mr. Harold Richards informed Miss Berry of his mother's death. 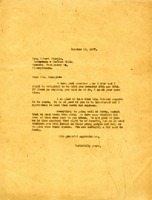 He also informs her of the book order his mother was working on and gave an update. 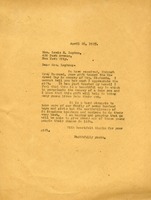 A check for $100 to The Berry Schools from Mrs. R. Burnham Moffat sent by Mrs. Hammond for Mrs. Waldo Richards Endowed Day. 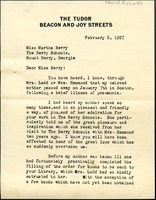 The Berry Schools acknowledged a gift from the Mrs. Hammond's mother, Mrs. White. 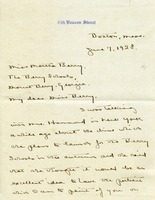 Miss Berry was away from the schools for another two weeks, but the author expresses thanks and assures Mrs. Hammond that Miss Berry would be touched by the gift and would send her personal thanks.